This M1-PCB is designed to simplify all your Jimmy Page upgrade projects, as well as all other electric guitar and bass upgrade projects that use a push-pull pot or mini-toggle switch. Does wiring tiny push-pull pot or mini-toggle switch terminals cause you grief? Can Electric Guitar and Bass Upgrade Wiring Really Be Simplified? Ask yourself these three questions. Do you want to simplify your electric guitar and bass upgrade wiring? Does soldering wires on tiny switch pins frustrate you? Do those Jimmy Page (or other) "Upgrade from Hell" projects give you heartburn? We have The Simple Solution for you. Our new M1-PCB (M1 Printed Circuit Board) is a multi-purpose product that simplifies electric guitar and bass wiring projects and reduces wiring mistakes. This is one of those "Why didn't I think of that?" products. The M1-PCB is ideal for all your pickup or other switching projects where DPDT mini toggle switch -or- push-pull potentiometer components are used. It solves the frustrating problem of connecting and soldering wires to six very tiny switch pins. You just solder the component to the M1-PCB, then you solder wires to the circuit board and they are electrically connected to one of the six tiny pins. With each M1-PCB, you also get six UY2 solderless connectors to give you EZ-Connect capability. You insert your wires, squeeze the button with pliers and the electrical connection is reliably made. This means that your effort at wiring the six very tiny switch pins of your push-pull pot or DPDT mini toggle switch cannot get any simpler than this. Personality #1: Pickup coil phase reversal. 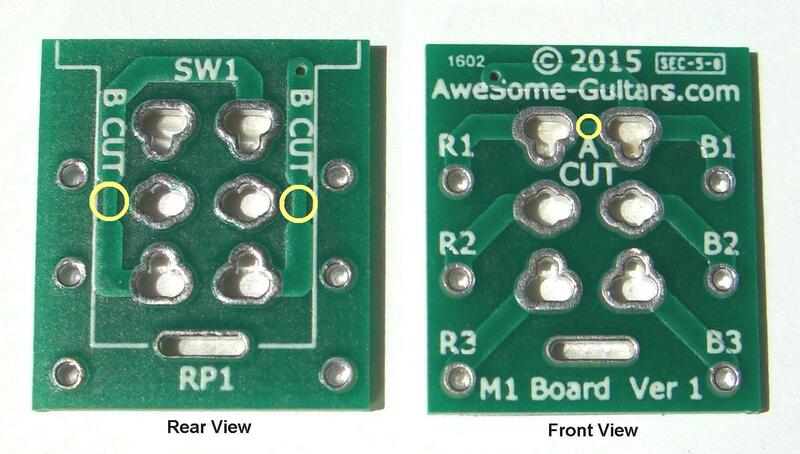 Solder a standard DPDT mini-toggle switch or push-pull pot component onto the M1-PCB and cut one "A" board trace. Now you can solder black and red wire pairs directly to the M1-PCB. These wires can be directly connected to both the pickup coil and the input circuit so you can turn the pickup coil Off or On; in either normal-phase or reverse phase. The M1-PCB has an on-board "crossover" circuit so you don't need to hand wire it. You can also use this personality with either of the following components. DPDT (On-Off-On) mini toggle switch for both On-Off and phase switching control. 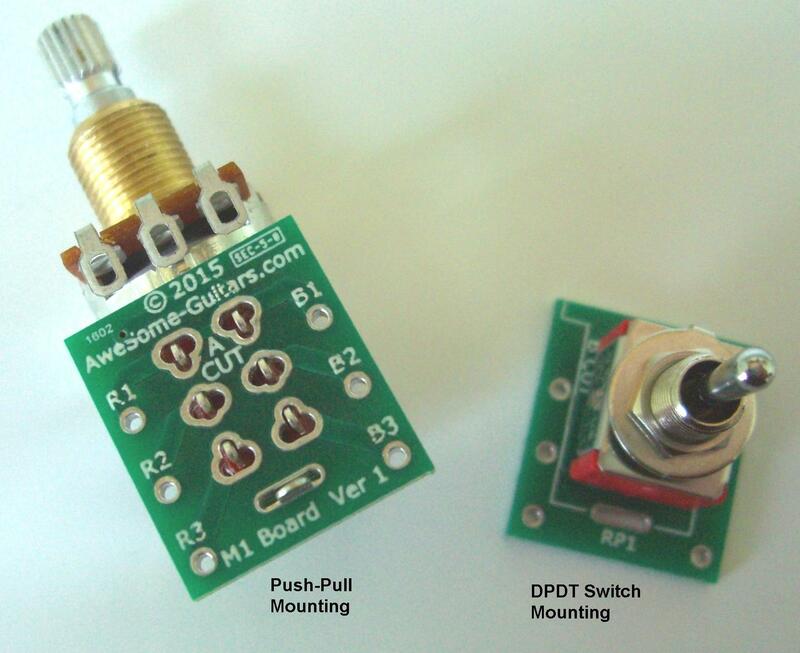 DPDT (On-None-On) mini toggle switch -or- a push-pull pot for just phase switching control. Personality #2: Put two pickup coils in series. Solder a standard DPDT push-pull pot or DPDT (On-None-On) mini toggle switch component onto the M1-PCB and cut two "B" board traces. Now you can solder black and red wire pairs directly to the board. This configuration lets you "span" two pickup coils to put them into a series circuit. Personality #3: Universal connections. When you cut all three traces (one "A" trace and two "B" traces), you electrically isolate each of the six switch terminals of either the DPDT mini toggle switch or push-pull pot component so they can be used for any wiring application. This lets you quickly connect or jumper any of the switch terminals. The point-to-point hand wiring is simplified because the wires are attached to the circuit board and electrically connected to the switch component terminals. Only the M1-PCB is being sold. Does not include push-pull pots or mini-toggle switches. They are used to show how the M1-PCB is mounted to these components to simplify your wiring efforts. Because you get a 30-day Return guarantee, you can buy this upgrade with confidence. End your wiring and soldering frustration with this product. You have nothing to lose except your grief. Notes: Ask questions before purchasing. Purchaser assumes all risk of liability with respect to the installation and use of these products. This switching system cannot be used with active (battery-powered) pickups or pizeo pickups.